Here at the Great Falls KFC and A&W, we pride ourselves on making sure every customer leaves with a smile! 10 Piece Mixed Bucket for 12.99! BOGO - Buy One Root Beer Float Get One Free! 8 Piece Meal for $16.99! 12 Piece Meal for 23.99! BOGO! 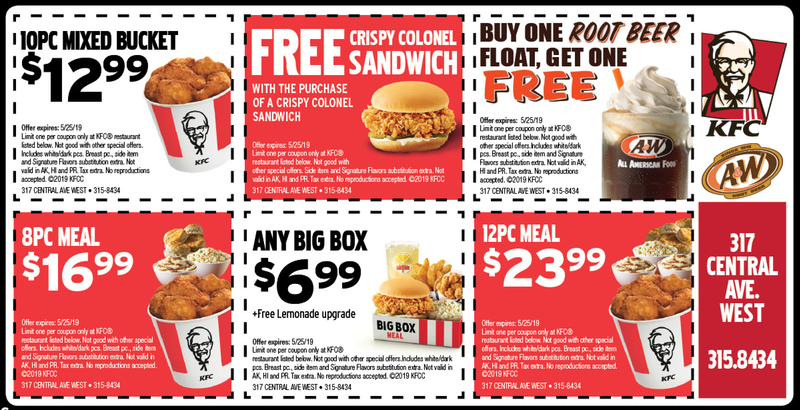 FREE Crispy Colonel Sandwich with the Purchase of a Crispy Colonel Sandwich! Any Big Box for $6.99 plus Free Lemonade Upgrade!